With each new version of Windows, Microsoft is making it harder for hackers and crackers to hack into Windows. Windows has also become less vulnerable to viruses and other malware by default as Microsoft has added securities like a built-in antivirus program and blocking removable media auto run functionality until selects to do so etc. But most people still fall prey to USB viruses because they attack automatically when a USB drive is inserted and auto-run is turned on. The best way to avoid viruses and keep yourself safe is to educate yourself about how computers work and how to keep it secure. In this article, we will go through the solution to completely remove pendrive shortcut virus from our USB drive and our Windows computer. Lately I have been asked about the pen drive shortcut virus by quite a few people including users of iTechtics through the comments on other articles. The symptom of this virus is that all the folders you copy to your USB drive will be converted to shortcuts. If you double click the shortcut, it will open the same folder in a new window. At first I didn’t take it serious until I came across an infected system myself. If you go to Google Search and search for a solution to pen drive shortcut virus, you will be greeted with a lot of pages with almost the same sort of solution. A batch file is being shared across all the pages that I came across. The batch file simply does three things; unhide all the files in the USB drive, delete all the shortcuts in the USB drive and delete two files called fypuas.exe and fypuasx.exe. While this is a solution, it is not a permanent solution as it will only last until the computer is restarted. If you restart your computer and insert your USB drive again, it will show the same behavior as discussed above. Before going through the steps to delete this virus from your system, let me give you a brief overview of what this virus does. This will make it easier for us to understand and solve the problem. This virus surfaced in 2010 and has been around with different names since then. It injects itself to system startup, creates a few executable files inside the USB drive which look like shortcuts, hides the original folders and files inside the USB drive, copies itself into the profile folder of the current user and connects to an outside computer. Download Hijackthis and install it on your computer. 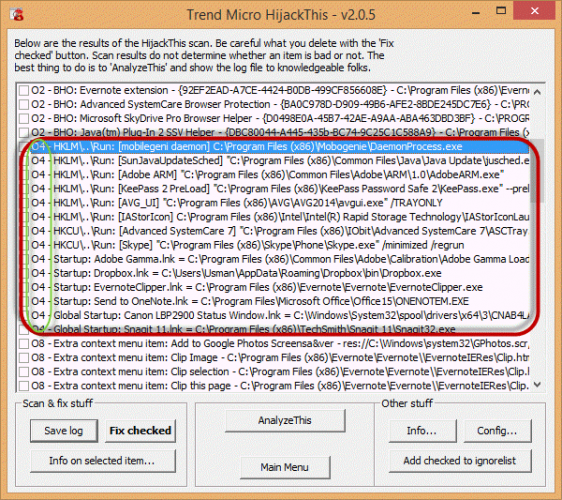 Scan your computer with Hijackthis and preferably save the log file. Hijackthis gives your a list of entries with codes at the start of each line. Each code has a meaning. We need to look at the entries with code ’04’. These are the entries which are executed when a user is logged into the computer. These entries will display startup items for all the users in the computer. Hopefully the above steps will cleanup our system from the pendrive shortcut virus. Now let’s clean our USB drives and restore our data. Open command prompt (Run –> cmd) and go to your USB drive. For example, if my USB drive is E drive, I’ll need to type E: and hit the enter key. This will take me to the USB drive inside the command prompt. This command will remove the following attributes from all files inside the USB drive; hidden, read-only, system. Following these steps should remove the virus from the USB drive completely. If you open your USB drive folder from Windows Explorer, you will be able to see all your files and folders restored inside the USB drive. After removing this virus, you should scan your system with a good antivirus so that it may be able to detect and remove traces of any virus inside your computer. You will be able to download AVG Internet Security 2014 free for one year. If you are still having problems with this malware even after going through all these steps, please let me know through comments and we can find a solution to your specific problem together. my pendrives name is PRATIK and when i open my pendrive it shows a folder with shortcut icon and the folder name shows (PRATIK 16GB) and then i open this folder it takes time to open and shows the files, but when i insert my drive into anothers PC this folder not opens and shows the folder is empty. Please i request you to solve my problem. I still could not get the solution to the problem. When i am cleaning all the shortcuts i.e. .lnk files I am getting a msg access is denied, and after that I am typing in that command (attri…) then nothing happens. when am trying to open my pen-drive a short cut is coming with a following message. RunDLL There was a problem with starting. \0YyOoEm8gYyWsliGg6eOQGoEkAqm8YyWwUu81. Y6Woua8YEm CUIawaslyGoUua0Eukc2iGgumoQiGC2A0YEw. THE SPECIFIC MODULE CANNOT FOUND. PLEASE HELP ME HOW TO REMOVE IT AND SAVE MY DATA.WAITING EAGRLY FOR YOUR REPLAY. Please send a detail explanation for this ,as am not so much familiare with this. hello my friend i n sort of this viruses use msiecxe.exe for doing that ??? Are you running the command prompt as an administrator? Sometimes ownership is not given to the administrator in NTFS file system. Please try to take ownership of the complete folder and give yourself full NTFS permissions. Then try the command again. It worked for me. Thank you ! Sushil you should first scan your system for viruses with a good antivirus and latest updates and then try to remove the virus from pendrive. i have a problem with automatic shortcuts creating in my pendrive. also was try the very solutions but this problem not fixed. so i request you to plz give me solution above. then the shortcut will created. such type error msg display. Strider X, thanks buddy….MCShield worked for me. I don’t find any process and file name fypuas.exe and fypuasx.exe. Please help me in resolving the virus issue. Eset nod32 antivirus can easily solve this problem. procedure that worked for me and I recommend you to try before intalling too many unnecessary software. If you do not know what CMD is ..then quit here, or just ask any kid or basic computer knowledgeable person to read this and do it for you. Both of them seem to be malware vb scripts. If you don’t recognize these files in your flash drive then you should probably delete them. If you have already run the autorun.inf file then you should scan your system for viruses to make sure that the system is not affected. I have MS Security Essentials in my PC. Is it a good antivirus to detect this kind of virus? Please reply, thanks. While very basic, Microsoft Security Essentials is a very good antivirus which keeps most of the threats and viruses from the system. i want to ask for help with you how to remove virus secure browsing in your laptop or pendrive.i have been infect with this virus. for the 1st time i face with this virus, i have format my pendrive. but this type of virus still in my pendrive. i still cannot remove it. panbuarasu the first thing you should do is to scan your computer for viruses. All the computers where you use your pen drive should be scanned. After completely scanning and formatting your usb drive again, share the results with us. Logically speaking, the pen drive does not have any viruses when it is formatted. It gets infected with viruses when it is connected with an already infected system. For virus secure browsing,first copy your file from pendrive as backup to other place and format the pendrive..Then u just need to run msconfig and untick secure browsing startup,after that, start task manager and end process secure browsing..then all work..
That’s perfect Ana that it solved your problem. HijackThis tool is the same except that it has been bought by Trend Micro a long time ago. Thank you very much for sharing this. Works like a charm. According to your advice,i cut the file from pendrive to Drive D: but when its completed then this file gone to hide again… And this one was a movie,i cant find it…. ** but i didnt use antivirus .. Plz give me a solution..
and when I do full scan it appears VBS/safa.sjd virus there again and again I google it and find that it is the same USB drive virus so can you help me please. I too have had the same infection. But I had to spend a few minutes to completely remove this virus from my PC and pen drive. Here are the thing what I did… I firstly installed Eset NOD32 Antivirus 6 program on my PC. Then Activated it using User Name and Password. Then, updated it. Then, I inserted my pen drive to the PC and scanned both the PC and pen drive completely. Then, I saw that the shortcuts were deleted as they were detected as viruses. Then, using the command prompt I removed the hidden attribute of all the files and folders which were in my pen drive. The problem was solved. Any good online scanner you can suggest? I’ve got Bit Defender installed in my PC but it did not detect the virus. I tried also Avast, Malawarebytes, Superantispyware, Smadav, but the problem is still there. I tried copying the content of the flash drive (only hidden files, not shortcut files) formatting the flash drive and then restoring the content but with no success. Oh, I forgot to mention that I did not find the fypuas.exe and fypuasx.exe files, not using Hijackthis, not in the task manager nor in my profile folder. The shortcut virus comes in so many forms and flavors. I think you have encountered another version of it. You may run a virus scan of your computer to completely get rid of it. Hello, I have read your post regarding the usb virus. I’ve had this problem for a few days now and I cannot find a solution. I have followed your steps but the system keeps regenerating the shortcuts after just a few seconds after they are deleted. Any time I insert a flash drive into the computer, all the files are converted to .lnk. Could you please tell me if there are any other solutions for this? If it’s appearing again and again that means your system is infected. You will need to scan you system with a good antivirus. You may use the online scanning option if you don’t want to install an antivirus on your computer. I have that virus but after I followed your helps I can find the fypuas.exe and fypuasx.exe in my computer.. But the shortcut virus is exist, please help me..
After following the steps above, you will need to scan your computer with a good antivirus to get rid of the pendrive virus completely. Did you scan your computer for threats? What error message do you get while deleting fypuasx files? Tell me the exact problem you are having ..